What’s the Big Deal About Ai Weiwei? 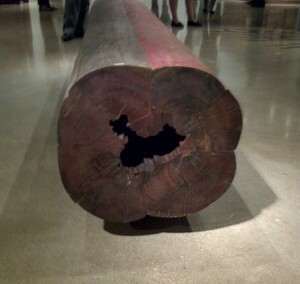 Toronto has been invaded by the art work of Ai Weiwei. This past summer and fall, his bronze sculptural installation at Nathan Philips Square of Circle of Animals/Zodiac Heads (a reinterpretation of the originals looted from the Old Summer Palace in Beijing in 1860), and the exhibition “According to What?” at the Art Gallery of Ontario, have permeated the local art scene. As well, Scotiabank’s Nuit Blanche event was dominated by his work Forever Bicycles. Consisting of an arrangement of 3,144 bicycles, it took 15 days for workers to assemble it. Combined with the opportunity to walk through the structure, the lighting, and dry ice, it made for a dramatic and memorable hit with the public. So what is the fuss all about and why is his work so ubiquitous? The main themes embodied in his work usually fall into, or combine, two categories: 1) an emphasis on the value of every individual human life, and 2) the creation of new works of art from destroyed materials, often wood from Qing dynasty temples which he reassembles. Accessibility to his work is significant. You don’t have to be an expert on Chinese culture or art to appreciate the creative force behind it. His work speaks cross-culturally. This is a common denominator to all great art. Anyone can emotionally access the impact of his work Straight, consisting of 38 tons of rebar (the steel bars which reinforce concrete in buildings). Ai’s response to the earthquake is embodied in a work which consists of metal bars from the twisted wreckage of collapsed schools where more than 5,000 children lost their lives. Ai has straightened each bar to represent a lost child. This work of art, 40 by 20 feet, varies in height like a rolling landscape. From the side it has the appearance of an earthquake seismic graph. There is even a fissure down the middle. Visually, and literally, this is a heavy piece. It protests the corrupt concrete construction business which built the schools, and the government’s refusal to officially acknowledge the number of people who perished in the disaster. An example of Ai’s assemblage of old materials using traditional techniques to create a new work of art, is China Log, 2005. Using tieli wood (iron wood) salvaged from eight Qing dynasty temple pillars, Ai creates an “opening” in the shape of a map of China. The nation symbolically appears within the pieces of jigsaw-like assembled pieces. It is both a political statement (due to the geographical boundaries Ai chooses to use to define China’s borders), and a social comment on how new creations evolve from the destruction of China’s traditional architecture. 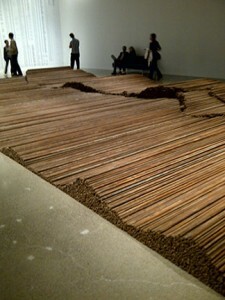 Why is everyone talking about Ai Weiwei? Simply put, he is many things to many people. The ‘worth’ of his art goes beyond the monetary. He is not only a master of various media, as sculptor, photographer, architect, ceramicist, and Internet blogger but also a galvanizing figure in the struggle for freedom of expression in a country where human rights are not always respected. He is an artist who deliberately takes risks and suffers consequences for his authenticity. 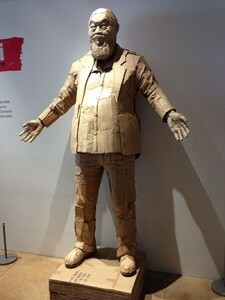 As such, Ai Weiwei can be counted as among the most influential artists of the 21st century. Want to learn more about contemporary Chinese art in Toronto? Check out the UCCA booth (Ullens Centre for Contemporary Art) visiting from Beijing at Art Toronto this October 24-28, 2013. They will be featuring limited edition prints of other famous artists such as Zhang Xiaogang, Wang Guangyi, and Yue Minjun, along with emerging artists. Still want more? 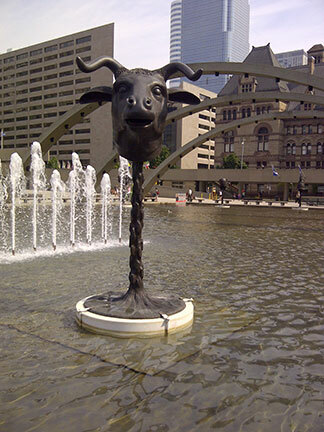 Visit the monumental public stainless steel sculpture The Rising by Zhang Huan installed in front of the Shangri-La hotel on University Avenue. Explore the work of Xiao Gui Hui, currently living and working in Toronto, who is represented by the Christopher Cutts gallery; and visit the Gendai gallery which features Asian contemporary exhibitions. To read more in English about Contemporary Chinese art, pick up a copy of the Yishu Journal of Contemporary Chinese Art. President, Eastern Art Consultants Inc.
http://easternartconsultants.com/wp-content/uploads/2013/11/Ai-Weiwei-AGO-Rebar.jpg 432 324 Susan Lahey http://easternartconsultants.com/wp-content/uploads/2018/06/eastern-art-transparent-tight.png Susan Lahey2013-11-12 17:55:192018-05-03 23:35:21What's the Big Deal About Ai Weiwei?